Pho is one of those rare foods I could probably eat everyday. Or at least I could have that consomme-style broth everyday. 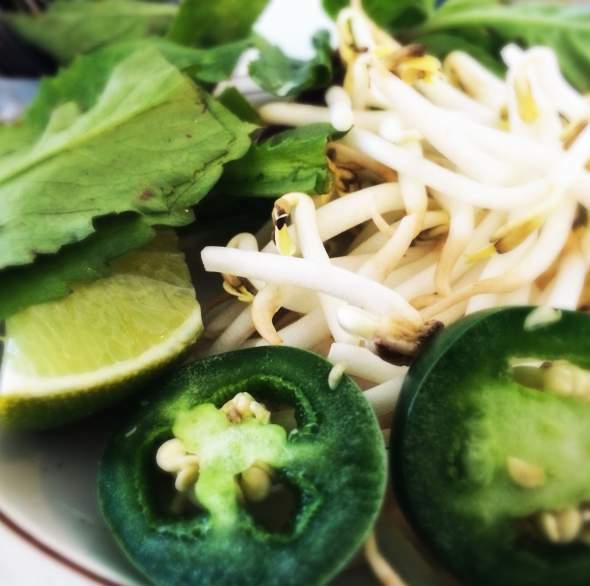 Pho, fo’ the uninitiated, is a wholesomely delicious Vietnamese soup. And if you like word play, boom, here is a whole new word for you to unleash upon the world. It’s pronounced like “fah” (and usage may include the following: “What the pho is this word play you speak of? This is Phonomenal!). “The broth for beef pho is generally made by simmering beef bones, oxtails, flank steak, charred onion, charred ginger and spices. For a more intense flavor, the bones may still have beef on them. Chicken bones also work and produce a similar broth. Seasonings can include Saigon cinnamon or other kinds of cinnamon as alternatives (may use usually in stick form, sometimes in powder form in Pho restaurant franchises overseas), star anise, roasted ginger, roasted onion, black cardamom, coriander seed, fennel seed, and clove. The broth takes several hours to make. For chicken pho, only the meat and bones of the chicken are used in place of beef and beef bone. The remaining spices remain the same, but the charred ginger can be omitted, since its function in beef pho is to subdue the quite strong smell of beef. The spices, often wrapped in cheesecloth or soaking bag to prevent them from floating all over the pot, usually contain: clove, star anise, coriander seed, fennel, cinnamon, black cardamom, ginger and onion. You need to know what goes into this process because quality control is an invisible but important hand at work. Clear broth means tender loving care from the chef. #fact. There are a variety of condiments and we’ll get to that in a minute. But as a friend pointed out to me the other day, every Vietnamese place in and around the Asian district, and elsewhere in the city, has their own way of doing things. You could visit 5 different locations and still come away with a different take on each one. Sure all the fixings are pretty much the same, but it’s the broth that really matters. My favorite so far has been Pho Hoa Lien, but make no mistake, it’s always a good to revisit others who do a fine job with this everyday staple. To that end, I asked a friend for a recommendation and got Pho Thai Nguyen. Initially I thought I’d never been to this place, but as I walked up the steps and saw the dumpling menu, I remembered that I’d been here once before. 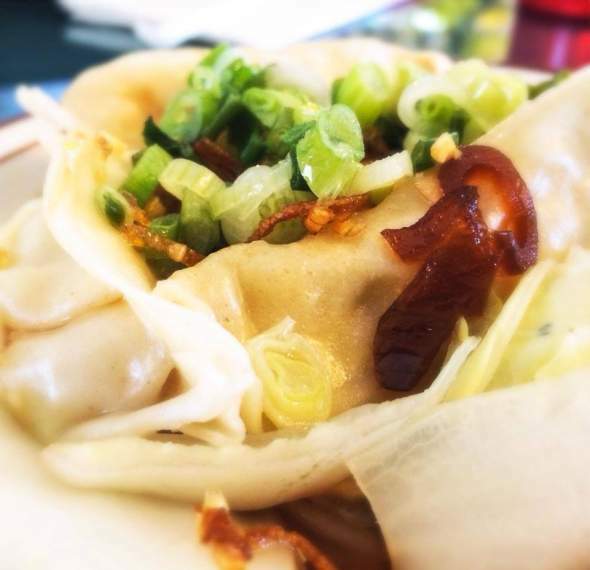 The thing that stands out about Pho Thai Nguyen is their everyday dumpling specials, which they serve up very deliciously. Pho-NOM-enal. Get it? Good. This was shrimp, by the way, but you are not limited to this choice. 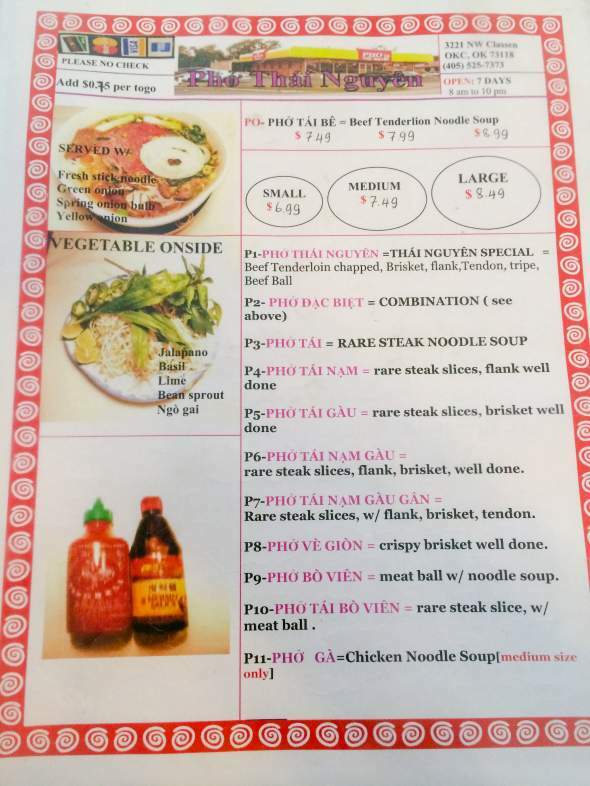 The Pho I ordered was P6. What can I say, folks. I was feeling extra carnivorous yesterday. But tripe and tendon gross me out and meatballs of questionable origin give me pause. That is why P6 is the meat lovers choice: rare steak, which cooks in the hot broth as it is served, flank, and brisket. The other thing that stands out besides the dumplings and pho, is the service. Not that I asked for more broth, but you will be asked if you’d like more if your bowl is running low but you still have noodles and goodies in it. I declined. I’d already seasoned my broth and wasn’t looking tweak it again. Left: house chili paste. Right: cook-your-rooster sauce. The other great thing about pho is the bevy of adds you can spice it up with. 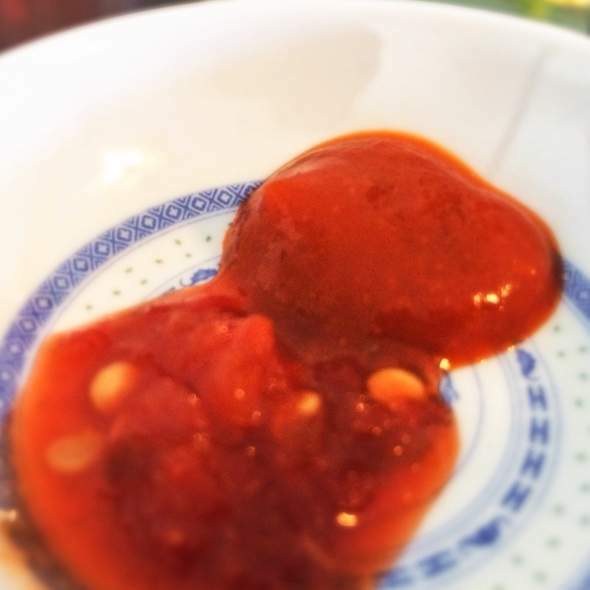 Pho Thai Nguyen offers up chili pastes from a house version to Sriracha. Most people love Sriracha, myself included, but every so often I like to deviate from the norm. I don’t like to put my taste buds in a box, or in this case in a very specific bottle. Sriracha is bright and tangy, sweet, and peppery hot. But their house chili paste, where ever it came from, is more fruity, tart, salty, and very peppery hot. I picked the latter that day. Hoisen sauce (think tangy, sweet), fish sauce (salty, fermented), soy sauce (tangier, salty, fermented), limes, sprouts (crunchy, bitter), Thai basil (more licorice flavored like anise than its Italian counterpart) and sawtooth herb (citrusy, herbaceous) are other options. I dialed up everything but fish and soy sauce. Tagged OKC, oklahoma, Pho, Phrases, Puns, Rooster Sauce, Shrimp, Vietnamese, Word Play. Bookmark the permalink.